Wow, these flip flops look real! Sun is shining here! It's 54 degrees at 9:30 am, high is to be 71. Ahhh yes, the wedding...can't believe our 2 year is just around the corner!? That card is so cute- love the flip flops! 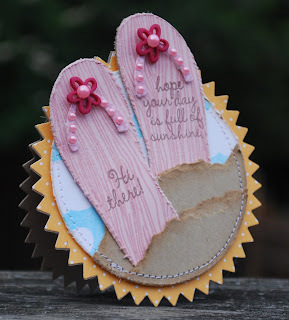 I forgot to say on Flikr - such a great idea to use the woodgrain stamp for the flip-flops! Just had to tell you how cute this card is! In Hawaii, we cringe when we hear "flip flops"--we call them "rubber slippers"! I think everybody on the island owns at least one pair......love the pink ones!! That's a great card...wish we had some sun here!!! but that card certainly made me feel happy.